On the first Mother’s Day since her passing, I am honoring her memory by posting the violin my Mom, Rita, made for me many years ago. It is a large piece 23 & 1/2 wide by 29 high (excluding the 2 & 1/4 inch wide frame). Mom worked on that off and over a 3-year period! I played violin from grade school through my early 30s joining a local community orchestra when I moved to Philly. After it disbanded, I put it away & finally donated it to our home town music teacher to find it a home. Earlier this year, I enjoyed a wonderful visit with my home town violin teacher. 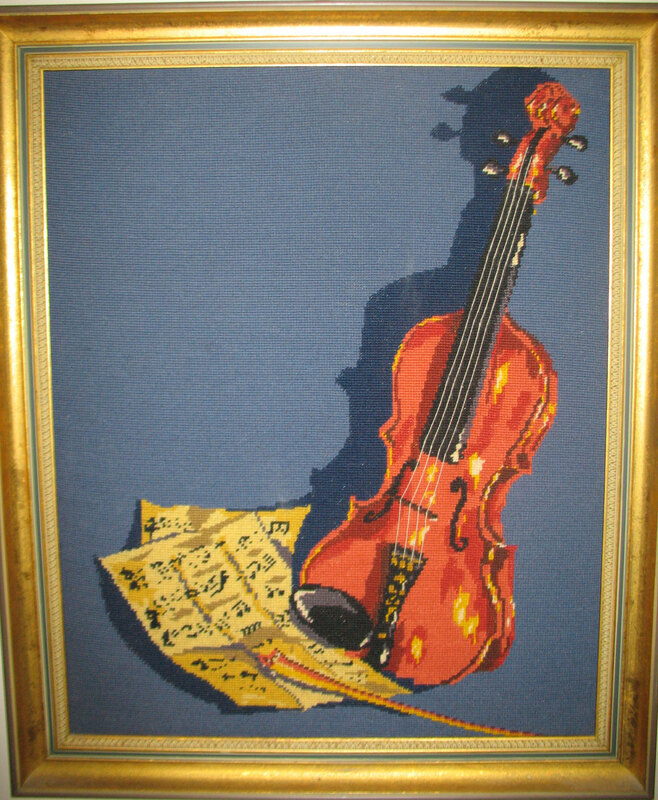 I still display the violin in our living room & was surprised when my bother commented that he could not find it on my blog! I do not know how I missed that in my first year of blogging. But, it seemed best to wait until today to share this piece. I love how dimension is brought to the piece by use of the shading. It was done in continental stitch because I remember seeing how askew the canvas was when it was done. And, Mom saying that the framer had a difficult time stretching it to block it. It was a counted piece – nothing stamped. She had quite a time getting the music notes & the strings placed to her liking. But, the violin and music turned out great. Love, miss, & think of you often.